Around 7:40 AM, a powerful earthquake struck close to Norcia. The monks are all safe, but our hearts go immediately to those affected, and the priests of the monastery are searching for any who may need the Last Rites. The Basilica of St. Benedict, the historic church built atop the birthplace of St. Benedict, was flattened by this most recent quake. 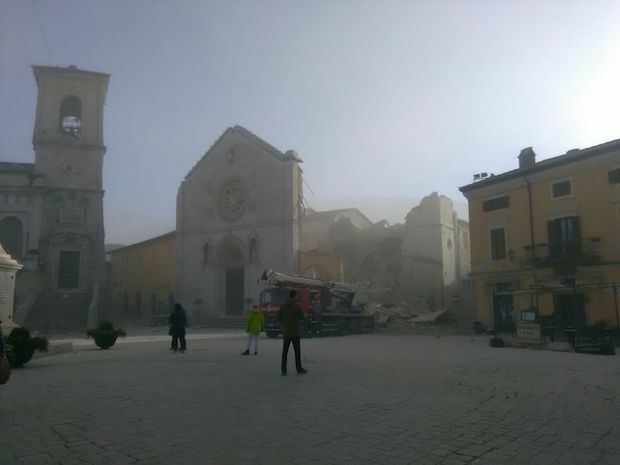 May this image serve to illustrate the power of this earthquake, and the urgency we monks feel to seek out those who need the Sacraments on this difficult day for Italy. After offering spiritual support to the people in town following this morning’s intense earthquake, the entire monastic community is together again at our mountain monastery which overlooks a now fractured Norcia. Messages are pouring in from all over the world, and we are grateful for your prayers for us and for the people affected. Because we want to be present to the people of Norcia, and also due to the poor cellular and internet connectivity this emergency has created in the area, we will be difficult to reach by phone or e-mail for a while. We want to assure our friends and family that we are safe, and also that we are doing everything possible to help to our suffering neighbors. Please continue to pray Norcia. Friends, I have no words this morning, at least nothing to add to Fr. Benedict’s note. That basilica has withstood so many earthquakes over the centuries. But not this year’s. Please, please pray for the monks, for the people of Norcia, and for the people of Italy who are suffering so terribly. This latest quake was so strong that Marco and his family, in the coastal city of San Benedetto del Tronto, had to run out of their own house. Marco says all over his city today, priests said mass outside their churches. The monks of Norcia need us all now more than ever. Please pray, and please, please give generously to the rebuilding. Posted in Christianity, Benedict Option. Tagged St. Benedict, Norcia, earthquake. The Benedictine Oblate candidates from the Ordinariate in SoCal will be praying. Mr. Dreher, I share your sorrow and offer my condolence to you and your associates and friends in Norcia. As you know, I’m not religious in the way you would define faith, but the churches, monasteries, and convents of Europe are important to me nonetheless and loss of those old stone edifices is hard to take. I am so sorry to see this. My prayers go out to all that have been affected by this terrible earthquake. I cried as I read about this first thing this morning and I well up again every time I see those devastating photos. My personal intentions for Mass this morning were for Italy and the monks. May God have mercy on all the people of Italy and the blessed Monks of Norcia. May God protect and preserve them all and help them rebuild. Sorry for the terrible destruction. I spent 3 days there. It makes me sad to see the destruction of the Abbey. St. Benedict will intercede for them I am certain. They are, the monks of Norcia, one of the shining jewels of what is left of religious life today in the Catholic Church. How terrible for Norcia and so many other Italian towns. Thanks for posting this. Terrible news, but it’s great to hear that the monks, who you have really brought to life for your readers, are all alright and rushing to their duty. I am so sorry to hear this, Rod. Such terrible loss. Very sad. I signed up to be a very small monthly donor. As soon as you know where and how to donate, please let us know. Lord, have mercy. All these buildings that have stood for centuries, ISIS destroying on one hand, earthquakes on the other… It feels cosmically significant. It’s later than we think. Heartbreaking! Now to grieve and give! These monks are faithful and will put every gift to good use. A new monastery will be built and it can be beautiful, its walls echoing with the ethereal chants once again. It’s being done elsewhere and can be done in Norcia. Umbrian ecclesiastical architecture is the epitome of noble simplicity. It can be done. And young Fabrizio, the brilliant local artist who worked wonders on the walls of the Norcia monastic refectory, can paint the new basilica! Hope and faith. And generosity. Let’s do it. Praying Psalm 46 for the monks. Or, given that anti-semitism is something the mainstream Church has blessedly renounced, don’t. Go monks! I’m signing up for a monthly donation and will buy all the beer they can make in Norcia.